Our interest in birding started more than three years ago when we first visited India. In Keoladeo National Park near Bharatpur village, we saw over 70 bird species in one day with help of a guide. The same day, we bought our first bird field guide with the birds of the Indian Subcontinent and this is when our new hobby started. Bird watching has enriched our travels in recent years. We don’t travel purely to watch birds, but when we are close to a special bird area, our binocular is working overtime. Bird watching also leads us to places that we probably wouldn’t have visited otherwise. Tourists normally pass by the national parks that don’t have big mammals to spot, but these parks often have bird life in abundance. Near the birding places there is always a certain hostel that attracts birders from all over the world. These are the places where you can gather information on where you can find certain bird species and at night everybody shares their adventures of the day. We like all birds, but there are certain species that we especially like to see. Birding fanatics normally aim at the rarest species, but we are also led by the looks of a bird. When we first flipped the pages of our field guide to the Indian Subcontinent, we fell in love with the enormous variety of Kingfishers, Barbets, Woodpeckers, Hornbills and Storks. 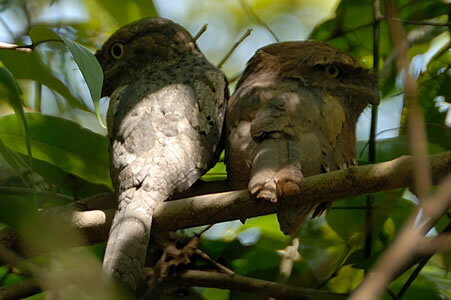 There was one kind of bird, however, that surprised us even more: the Frogmouth. These nocturnal birds are mainly brown and have a wide, flat beak. They eat insects and rest during the daytime motionless on a tree branch, which makes it almost impossible to discern them from some dead leaves. Birders associate the birds with their large heads, wide beak and long moustache hairs with Asia, but in the years that we have travelled on this continent we have never seen one. At the moment we are in Goa, the most touristic state of India. Beaches are packed with baking British and the Russians have also escaped their fierce winter by coming to this tropical part of the world. We have read about a place called Backwoods Camp in our travel book, a kind of resort for birders with a large variety of birds. There would even be a chance of spotting a Frogmouth! We decide to forget about the sandy beaches and to go for four days to Backwoods in the Bhagwan Mahaveer Wildlife Sanctuary. It is said to be a basic resort, but the cottage where we stay has its own bathroom and is tidy and comfortable. The setting of the resort is beautiful. In a part of the forest, they left all the big trees standing and they only cleared the undergrowth on the places where they built the cottages. Our feathered friends are everywhere. 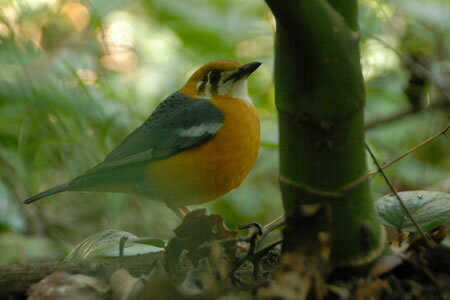 Woodpeckers tick fervently in the trees and the Orange-headed Thrush isn’t bothered when we watch him scratching between the dead leaves on the ground. Three of the four days at Backwoods, we are joined by twelve other birders. The couples don’t know each other upon arrival, but because of the common interest in birds we all get along very well. Luckily, everybody cares about each other. First priority is to make sure that everyone has seen a certain bird and only afterwards the people who like to take a picture get a little bit closer. The days start early with coffee, tea and biscuits after which it is time to start the first birding session. The group is accompanied by two guides. Normally, a group at Backwoods isn’t larger than twelve people, but our group preferred to stay together with two guides instead of being split. The numbers of birds is remarkable and include many spectacular species, like the Hornbills (Great Hornbill, Malabar Grey Hornbill and Malabar Pied Hornbill) and the beautiful Malabar Trogon. Around 9:00 a.m. we get a nice breakfast after which we start the second birding session of the day. The birding locations are normally within a ten minutes drive from the Backwoods Camp. Our guides Leven and Pramod know exactly where to look for the different species of birds. With help of telescopes, the birders can get a good look at the birds. Rare birds like the Oriental Dwarf Kingfisher, take some time to find but it is exciting to see this little dwarf this well. During the lunch break at the hottest hours of the day, it becomes a daily ritual to have a peak at “the small branch with the dead leaves”. There live two couples of Frogmouths on the resort premises and one of those couples has the nice habit of resting every day on the same branch. From a reasonable distance, we can see those special birds very well. Sometimes, they look with their shiny yellow eyes at us but most of the times they are dozing off. Frogmouths appear to be as remarkable in real life as the picture in our bird book! Our last birding session of the day starts after the lunch break, and the day ends with a tasty and healthy diner. The food during these days is very nice with a lot of rice, vegetables and chicken in the evening. To toast on a successful day of birding, we empty some cold bottles of Kingfisher (the famous Indian beer brand). After three days, the other twelve birders are going back to their hotels in other parts of Goa. It turns quite in the camp, but luckily the birds are always there. Pramod stays with us and shows us another ten species of birds that we didn’t saw at Backwoods before. After this extra day, it is also time for us to say the Backwoods Camp goodbye. We feel sorry that we have to go, not because we are not satisfied that we have seen over hundred different species in this area but because it is a lovely place to spend some days. Everybody with only the slightest interest in birds and nature should consider a few days Backwoods when they are in Goa for a beach holiday. After seeing the beautiful species of Kingfishers, Barbets, Trogons, Hornbills and Woodpeckers that are relatively easily seen here, this could be the place that awakens the birdwatcher in you. In that case, you have a good chance that you can also add the Sri Lankan Frogmouth on your bird list. We had to wait more than three years for this bird, but the Frogmouth was well worth the waiting.